Vampires and werewolves are often portrayed as existing alongside humans in modern fiction and film. While some use their beauty and allure to form dramatic relationships with human beings, others are untrustworthy monsters determined to prey on ordinary men and women. These shapeshifters and undead beings fascinate us because they embody the dark side of human nature and reflect some of humanity's most primal fears. All of these strange creatures of the night have their roots in stories that have existed for centuries in folklore and mythology. 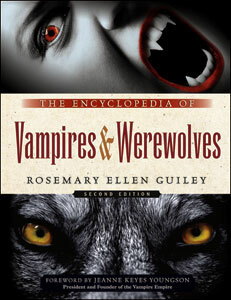 The Encyclopedia of Vampires and Werewolves, Second Edition provides more than 500 entries exploring the supernatural aspects of these creatures and their pop culture counterparts. Entries describe supposed true historical accounts, how vampires and werewolves come into existence, beliefs about vampires and werewolves, and real-life creatures and cases that may have inspired their legends. The most popular fictional vampires from a range of media are discussed, along with the people who helped create them. Real-life vampire and werewolf lifestyle subcultures. Also included in this invaluable resource are more than 150 full-color and black-and-white photographs and illustrations, suggestions for further reading, and a bibliography.